China is technology developing country with its growing technology penetration rates. China accounts for large number of TV manufacturers with some of them being global players such as Haier, TCL, LeTV and Xiaomi. Since the television era began, TV has been the major source of entertainment. The technology advancement in China has led to growth of smart homes and smart offices with smart TV being basic part of it. Smart TVs along with serving its original purpose of entertainment, it also works like a DVD player, music player, running internet based applications i.e. transforming TV into a computer such as streaming videos from Youku, iQiyi, 91 VST, Tvmao and PPTV. Though smart TV functions are important but the screen size, display type and resolution are also important factors impacting the preferences of the customers. High personal disposable income of the people of consumer electronics and their shifting preference towards smart homes and smart offices environment are majorly driving the growth of the market. In 2017, globally 245.1 million smart TV shipments were recorded, with China being one of the major suppliers of smart TV. Further, smart TV sales in China were increased by nearly 14% in 2017 from the sales in 2016. Of the various applications of smart TV, more than 55% users need is for watching videos, around 30% for playing games, 10% for education purpose and rest for other uses. Thus, the purpose of watching videos has exceeded the growth of China smart TV market. Goldstein Research analyst forecast that the China smart TV market is set to reach USD 36.1 billion by 2024, expanding at a CAGR of 4.61% over the forecast period (2016-2024). Flat screen type smart TV accounted for largest market share of 53.6% in 2017, due to its lower price and high demand majorly among the middle income group of people. But over the forecast period curved screen type smart TV is expected to take over the market share on the back of being technologically advanced and its rising demand. The report covers the present ground scenario and the future growth prospects of the smart TV market for 2016-2024 along with the market players’ analysis. We calculated the market size and revenue share on the basis of revenue generated from major players in the China region. China smart TV market is forecasted on the basis of smart TV production and supply. China Smart TV Market Outlook 2016-2024, has been prepared based on an in-depth market analysis from industry experts. The report covers the competitive landscape and current position of major players in the China smart TV market space. The report also includes porter’s five force model, SWOT analysis, company profiling, business strategies of market players and their business models. 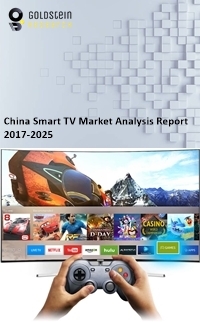 “China Smart TV Market Report” also recognizes value chain analysis to understand the cost differentiation, pricing models to provide competitive advantage to the existing and new entry players. Our China smart TV market report comprises of the following companies as the key players: TCL, Haier Consumer Electronics Group, Hisense, Changhong, Konka, Xiaomi, LeTV, Sony, Samsung, LG Electronics, Panasonic, Koninklijke Philips N.V., Hong Kong Skyworth Digital Holdings, Logitech International, Onida Electronics, Toshiba, Videocon, Hitachi, Ltd., etc.